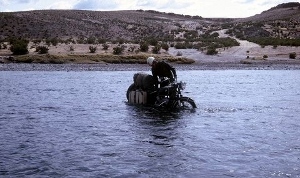 In 1963 Keith Thye and friend Dave Yaden dropped out of college for a year and took an eight month, 25,000 motorcycle expedition from Portland, Oregon to Pucon, Chile. Their adventures and the conditions that they experienced were life changing. 50 years later the two decided to embark on what would be basically the same journey. But what was the same and what changed in that time? What lessons can be learned from doing the same journey at a different time in life? We decided to talk with Keith to find out. Sound RIDER! 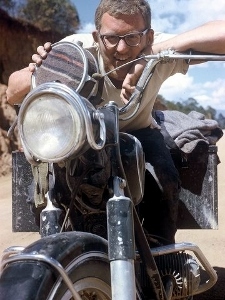 : Fifty years ago you dropped out of college for a year to take a huge motorcycle journey. What inspired this massive adventure? Keith: My father immigrated from Denmark to the United States when he was 20 years old, not knowing the language or much of anything about the United States. That was a true adventure. Then one summer vacation from college my older brother did a three month Vespa trip through Europe. Hearing his stories inspired me to have my own adventure. I wanted to do something that no one, at least that I had heard of, had done before. South America by motorcycle became my target. 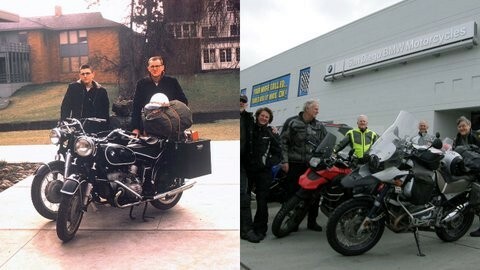 Having owned and ridden a Vespa for my high school years I, graduated to a BMW R50 and recruited my friend Dave Yaden to accompany me on this eight month journey. Sound RIDER! : What determined your route at the time? Keith: South America was chosen for a couple of reasons. We could travel there inexpensively; no ocean crossing with our motorcycles was required; we could do an entire land route (except for the Darien Gap from Panama to Colombia, which still has no road); the Pan American highway extended from Portland, Oregon (our departure city) to our destination. Little did we know at the time that much of it was nothing more than a goat path and that bridges over water crossings were few. Dave and I grew up in Lake Oswego, Oregon. A few years earlier the city adopted a “sister city” (in vogue at the time) with Pucon, Chile, about 500 miles south of Santiago. No one had made the cross-city visitation by land (I wonder if anyone else has still?) and it sounded adventuresome. Sound RIDER! : Taking such a huge journey at that point in your life was no doubt life changing. What was the big lesson you learned from that trip? Keith: Patience: Planning the trip took a year and we had no template to go by. There were many frustrations during the journey and we had to cope. Humility: We were gone for eight months and spent a total of $1200 apiece but compared to the people we met and traveled among, we were rich by comparison. Improvisation: Fixing a breakdown at 15,000 feet in the air, or how to get out of a Peruvian jail was all new to us, as examples. Sound RIDER! : Fifty years later you decided to take a very similar journey. What inspired you to do the trip again? Keith: That trip fifty years ago we were looking for adventure and we found it. This time we wanted to relive some of those past experiences and places, but in a more comfortable mode (eg. hotels instead of a small tent). We remembered many of the places and landmarks and were curious about them today. Sound RIDER! : What were the big differences in the two trips? Keith: Two huge differences. One, of course, were the roads. In 1963 the Pan American highway was nearly all dirt, much of it a difficult ride, and most water crossings had no bridges. 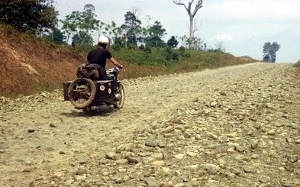 Today nearly all of the highway, and many of the secondary roads are paved, albeit loosely defined. Secondly, and even more contrasting, is communications. Fifty years ago when we wished to communicate with home we would hand write a letter and mail it in the local post hoping the letter would be received, which sometimes happened and sometimes not. Today there are cell phones, satellite phones, wi-fi and the internet, Skype, etc. Then, we had to carry 50 rolls of film and occasionally ship them home. Today a digital picture can be distributed throughout the world within minutes via the internet. A few other things we have today that were non-existent then: credit cards, ATM cards, GPS (couldn’t even get decent road maps then) and bottled water. It is certainly a different world today. Sound RIDER! : Were there any new insights from this new trip? Keith: Most of the economies in South America are improving economically and politically, although unrest is still just a new dictator’s stone throw away. Much of Central America still struggles to join the 21st century. Most of the people, however, seem unchanged in personality and culturally. Sound RIDER! : OK, so what about the actual riding… what should folks know if they’re heading out on a motorcycle to these parts of the world in terms of roads and riding? Keith: Be careful---this can still be a dangerous part of the world. Do your homework and plan accordingly---missing a visa or required paperwork can create a delay and needless headache. And do not plan a daily itinerary before embarking on a long journey. Anything can happen to delay the trip. So take your time and enjoy it. Most importantly, just do it (to steal a phrase). Sound RIDER! : What else should we know about the trip or about your upcoming presentation? Keith: I have previously presented a slide show of the first trip in the dealership. This presentation is different in that it is not just a travelogue, but rather a comparison of the two trips. 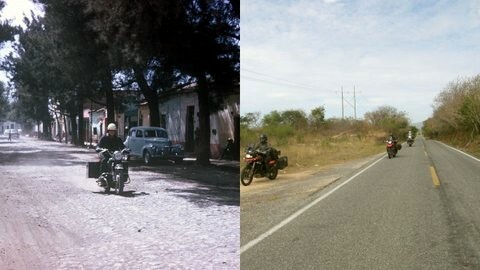 Many of the places we visited are depicted with “before and after” pictures, or “then and now”. And what an interesting contrast it is. Keith Thye will be presenting a slide show and discussion of his incredible trips, comparing and contrasting the two, at South Sound Motorcycles on Saturday, March 15th at 7pm. You can learn more about the event at http://bit.ly/ThyeEvent or call 1-800-303-1838 to purchase tickets.